I always have a sense of gleeful anticipation when I begin a book from Kristen Ashley, and I suppose that’s because I have yet to encounter one that I didn’t get swept up in and enjoy immensely. The characters are always richly layered as is the story itself. I always have a sense while reading that I would want to know them, to be friends with them. I always feel the emotional highs and lows that the characters experience themselves. I also think that there are subtle lessons to be learned. Lessons about what constitutes family…which is sometimes chosen rather than a circumstance of birth. I find that to be especially true in the Chaos series, and it’s a theme that I personally identify with. Ride Steady does not disappoint! Carson “Joker” Steele endured a childhood of both abandonment as well as terrible emotional and physical abuse. However, he did experience genuine love and caring from 3 people. He was related to none of them, but I think they helped make the difference between the man Carson became versus the man he could’ve become. He took off from his abusive home life when he could stand no more. When he returned to Denver seven years later he knew that he wanted to join the Chaos brotherhood, and he did what he needed to do to make that happen. Carissa Teodoro was a cheerleader who had suffered several devastating events, but who came from a loving family. She was good and kind, and didn’t participate in the meanness that can sometimes occur in the upper cliques of high school. She was not a girl who had a strong ambition for a high paying, fancy career. No, what she wanted was simple and fundamental. To be a great wife and mother who created a happy and loving family life. She thought she would have that with Aaron Neiland. Sadly, she was wrong. Carson and Carissa knew each other in high school, but what they failed to realize is that each had a crush on the other. When they finally meet again it happens on a roadside where Joker has come to her rescue, and while Joker recognizes Carissa, she does not do the same. Still, he makes a huge impression, and she is determined to seek him out and to thank him. And so it begins. What follows is a tremendous story of second chance love for two people who truly deserve it. There are obstacles for them to overcome. Feelings of self-doubt, and not being good enough arise for both of them. Carissa’s ex-husband tries his best to interfere, and to reclaim her. You’ll absolutely loathe the man! One of the things I love best is that despite his initial hesitation, it’s Joker who really understands all of Carissa’s deep-seated fears and insecurities. He’s gentle yet straight forward in how he deals with her. He doesn’t want to change her into something else. He just wants her to be happy and fulfilled and to truly understand what a wonderful person she is. I also love the ease in which he responds to her very young son, Travis. It continues and I’ll share that I ugly cried. I have to mention that Ride Steady includes many favorite characters not only from other Chaos series books, but from others as well. Lee and Hank Nightingale, Hawk Delgado, Knight Sebring, Mitch and Brock to name several, all make appearances, and that rocks! Their inclusion makes the story even better and Kristen is one of the very best authors in the way she provides continuity through the bigger family and community that is always present in her books. It’s one of the many reasons she is and continues to be one of my forever favorites. The journey that these two take is unforgettable. Joker and Carissa…who he calls Butterfly…are two characters who will steal your heart…deservedly so. I absolutely give Ride Steady my highest recommendation and book crush status. I laughed, I cried, I got pissed off, I felt hope and joy, and all the feels for the heat which Kristen always writes exceptionally well. This book releases tomorrow and is worth every single penny! I’ve already done one reread, and I know it won’t be the last time. 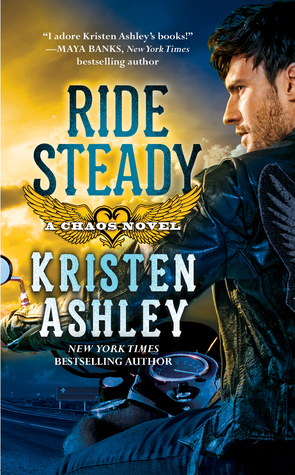 This entry was posted in Adult Romance, Badass, Badass biker, Book Crushes, Book Recommendation, Books, Favorite Authors, Kristen Ashley, Reviews and tagged Adult Romance, Badass, Badass biker, Book Crushes, Book Recommendation, Books, favorite authors, Kristen Ashley, reviews. Thanks for the review. Sounds like another KA winner. Can’t wait to read it.